I noticed on my google/ig today an option to change the theme ("Select Theme" as pictured about). I picked a nice one and was prompted to enter my location so that the theme changes with the seasons. Very cool. If you haven't already checked out google/ig, I would suggest giving it a try. 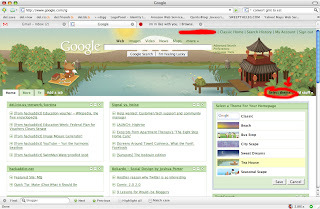 It's very 'google' in it's minimalist design and lack of options / bells and whistles. I like it because it loads pretty fast and uses my google login, which I pretty much always have open because I use Gmail and Google Docs. What do you use for your rss reader?